Cozy, colorful cushions that are easy to carry to your favorite sitting spot! 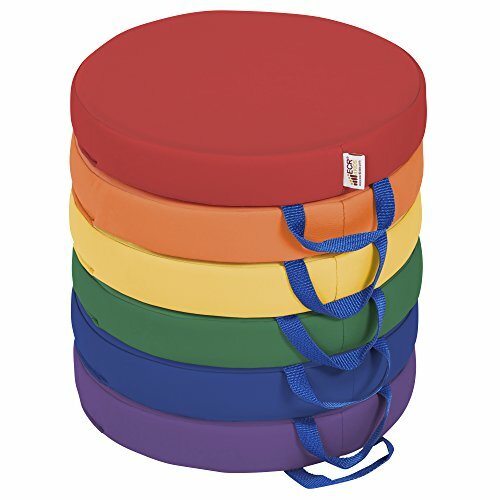 softzone floor cushions with handles are a comfortable way to implement flexible classroom seating into any setting. Pack comes with 6 cushions. With sewn-in handles and 2 inch of dense foam, these cushions let little ones sit comfortably anywhere. Perfect for circling up on the ground for stories or snacks. Covered with a soft leather material that's available in a wide range of colors. Non-Slip bottoms keep the cushions in place during use. Cushions come in packs of 6 with your choice of squares or Circles. The soft, colorful polyurethane cover is durable and easy to maintain — just wipe clean with mild soap and water solution. Recommended for children ages 3 years and older. No assembly required. Softzone floor cushions are phthalate-free and have achieved GREENGUARD [gold] Certification, are CPSIA-compliant for safety and adhere to ca-117 requirements for fire retardancy. With a concentration on the Pre K-12 sector, ECR4Kids offers a wide range of products including classroom tables and chairs, preschool rest time solutions, hardwood storage cases, blocks and manipulative, mobile organizers and a variety of indoor and outdoor play structures.